Is it your goal this year to eat healthy and get fit? If the answer is a big YES, you should consider working Asian dishes into your weekly meal plan. 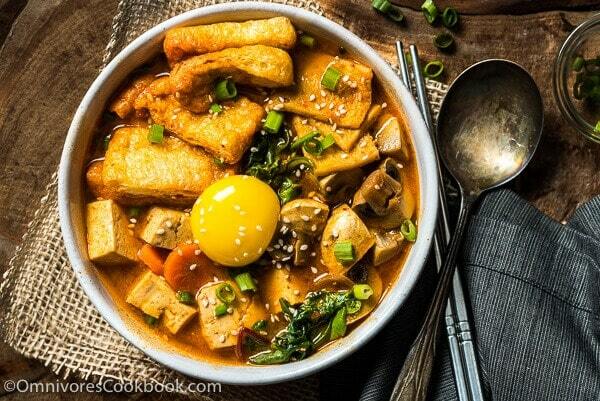 As I mentioned in my last post, 10 Asian cooking tips to help you cook faster, eat better, and lose weight, Asian food has a strong tendency to use low-calorie and wholesome ingredients, flavorful seasonings, and very small amounts of protein to create satisfying and nourishing meals. 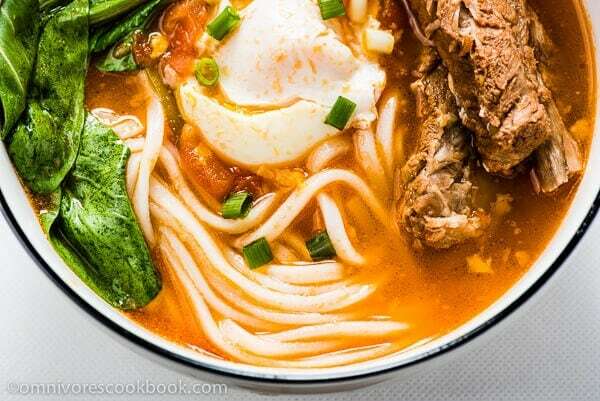 Today, I want to introduce ten Asian soup recipes that are hearty, low in calories, and quick to cook. The best part is, you can easily tweak them into one-dish meals using whatever ingredients you have in the fridge. It really eases the burden of coming up with ideas for dinner during a busy week. The soup might sound very plain, but the soup base is super flavorful. In this post, I introduced two methods for creating a rich broth without using stock. The post also includes a tender and moist turkey meatball recipe that you can use to enhance any other Asian soup. 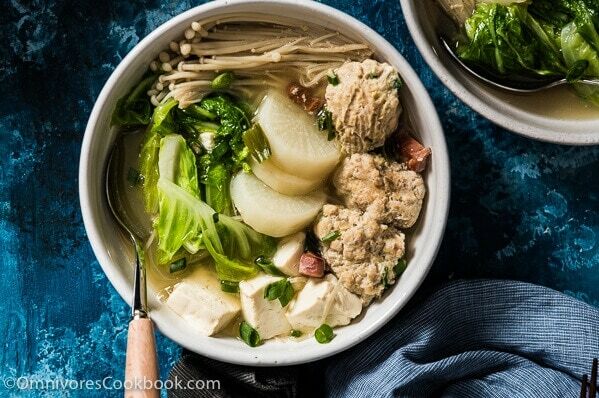 You can throw all kinds of ingredients into this soup: napa cabbage, cabbage, tofu, bamboo shoots, mushrooms, radishes, mustard greens, bok choy, sausage, mung bean noodles, zero-calorie magic noodles, etc. Did you know that you can use this classic soup base with almost any type of veggie and meat? This recipe does not require chicken stock and is very flavorful. Can you believe such a scrumptious soup takes just 30 minutes to prep and cook? Add a handful of veggies and a small portion of rice noodles, and you’ll be all set for dinner. The recipe list might look long, but it takes no effort to cook. You can use canned tomato and frozen ginger to cut down on prep time. Both root and green vegetables go well with the soup. 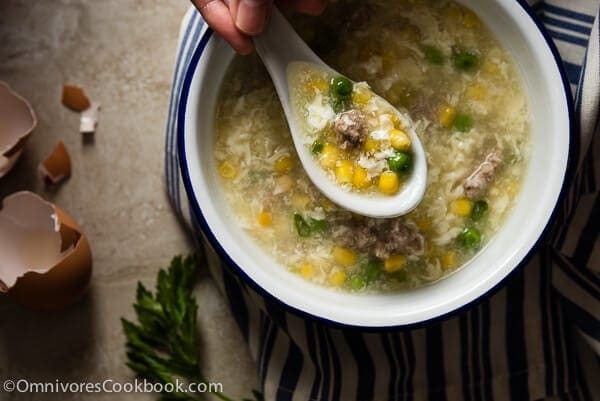 You can throw in some protein while simmering the soup, or top it with any leftover meat you might have. 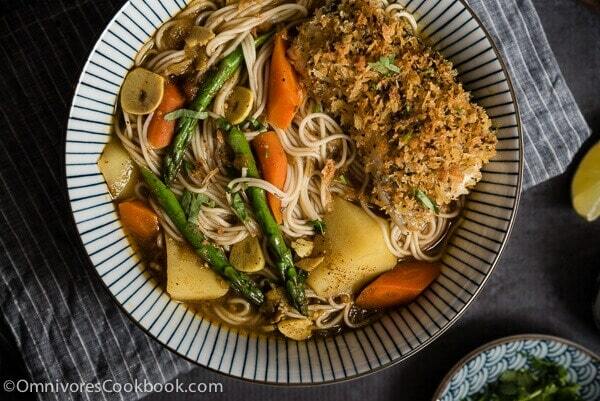 If you’re adding plenty of root veggies, you can skip the noodles and still make it a full meal. The original recipe contains 836 cal. per serving, because I used fried fish, plenty of potato and noodles. You can easily cut one third of the calories by using grilled fish (or chicken) and use less noodles. The original miso soup is not a one-dish meal (you can serve it with a bowl of steamed rice and a simple piece of grilled fish to make it a full meal). But you can throw in more veggies, protein, and some noodles to make it substantial enough for a meal. 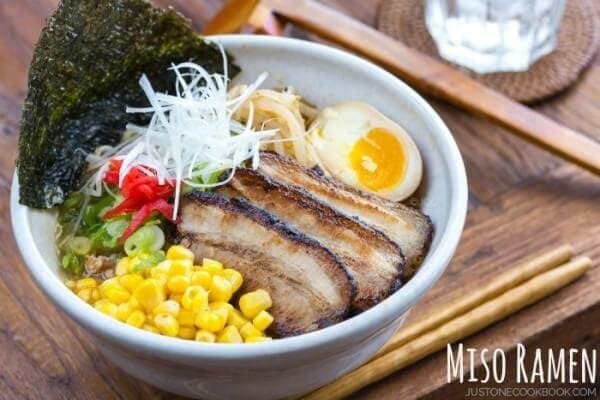 For a more scrumptious dish, you can make miso ramen or vegetarian ramen in under 25 minutes. The most versatile dish ever. You can throw in basically whatever ingredients you like, and still get a tasty soup. It can easily be converted into a vegetarian dish, too (tips included in the post). Ingredients of your choice: all kinds of seafood, all kinds of ground or lean meat, root vegetables, broccoli, tomato (fresh or canned), all kinds of greens, mushrooms, tofu (fresh or fried), rice noodles, mung bean noodles, zero-calorie magic noodles, fish cakes, quinoa, steamed brown rice. 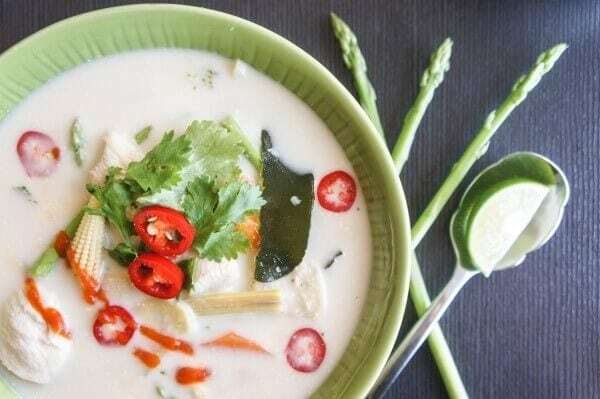 This quinoa asparagus Tom Kha Gai is a perfect example of how you can tweak a classic Asian soup with the ingredients you have on hand to fit your diet. Only takes 25 minutes to prep and cook. Versatile and very hearty. Also a great way to use up leftover meat. You can use this soup base for wontons too. As satisfying as dumplings, only easier to make. I recommend you wrap your own wontons with fresh ingredients because it is tastier and even lower in calories. Wrapping wontons is not as tricky as making dumplings; just check out the video in my post. You can make them in big batches on the weekend while watching TV and freeze them for later use. It’s fun! Ingredients of your choice: you can use turkey to replace pork in the filling; you can use all sorts of blanched green vegetables in the soup base; if you cannot find the dried goods to make the soup, use chicken stock or this tomato based soup instead; you can add a small amount of noodles to make the dish very filling. This is not the most versatile dish, but you can easily turn it into a one-dish meal by adding corns. Plus, you can use chopped frozen veggies to cook it with zero effort. Do you like my recipes? Sign up for Omnivore’s Cookbook’s weekly newsletter to get the latest updates delivered to your inbox and a free e-cookbook! What a gorgeous collection of healthy soups, Maggie! 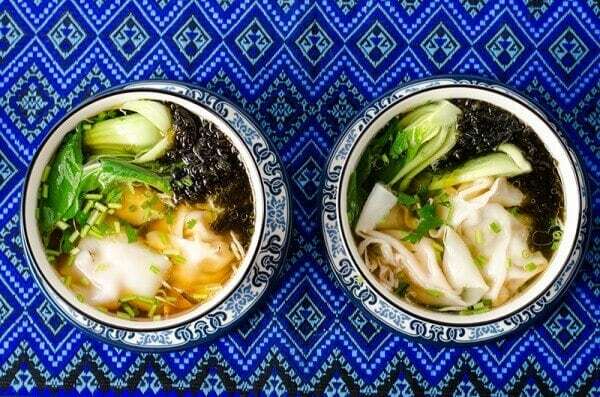 And I LOVE the photo of the wonton soup! Love this round-up, Maggie! It’s been so cold here and me and the kids got the flu so healthy soup is just what we are looking for! Everything looks incredible! Pinning and I can’t wait to try a few of these! Stunning round-up, Maggie! I want to every single one of these – but I would start with the Tomato Noodle Soup – that one always catches my eye. Simply gorgeous! Thanks Maggie. Your ideas are full of all the great street food dishes I loved when living in Asia for many years. I am no cook but most of the Asian ingredients are easily available here. And the recipes as you describe them give me the confidence to have a go. I’m also looking forward to checking out your other recipes. Cheers. Hi Mark, I’m so glad these recipes bring back your delicious memories of Asia! You don’t need to be a cook to make delicious Asian food at home 🙂 I hope you’ll try out some of the dishes and enjoy them. Happy cooking and let me know how the dishes turn out! These soups look wonderful and easy. I am a great fan of Pho soup and I make it well, but its costly and time consuming so I save it for special occasions. thanks Maggie for your great effort. I was just looking up healthy recipes and your wonderful soups popped up. However i just realized that we share the same name. This intrigued me to continue my search. I am excited to be trying the egg drop soup this week. Thank you for such wonderful and simple recipes. Hi Maggie, great collection of soups, I have just made a won ton style soup, I cheat though, I get frozen dumplings, vegetable and kimchi style, from the Asian supermarket! I made it with ginger, garlic, red chilli, some mange tout, carrot, spring onions and bean sprouts, and a splash of lime and some toasted sesame oil, and threw in some egg noodles on the side with a splash of dark soy and toasted sesame oil, as I was quite hungry, washed down with some jasmine tea afterwards. 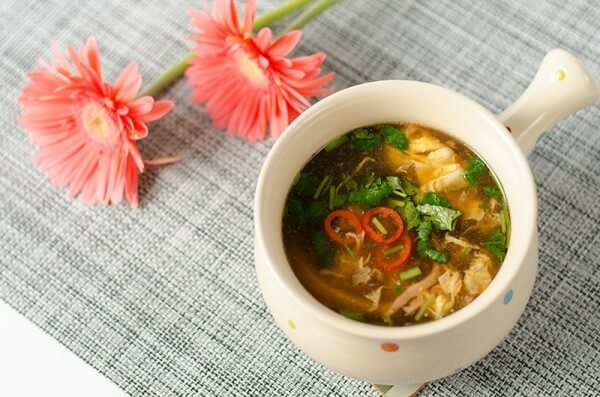 I love oriental soups, speedy to make, economical, healthy and super tasty, and I love the aroma around the house whenever I have been making oriental food. 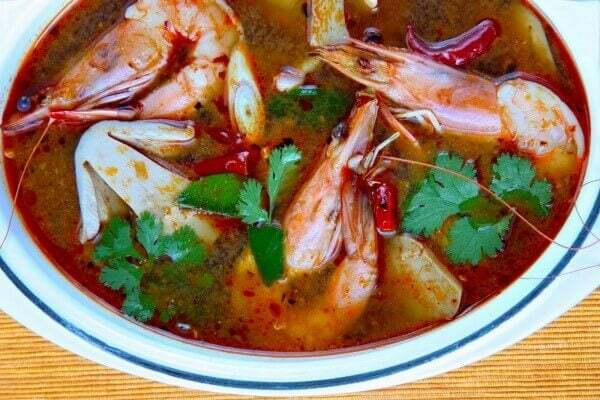 I am going to make some hot and sour soup next I think, as this is another one of my favourites, I am particularly fond of the Thai style soups and Tom Yum/Yam is one of my top choices whenever I can get it or make it. Tonight I am having cha sui with bean sprouts, bok choi and steamed rice, can’t wait!!! Hi Neil, I totally agree. Asian soup is easy to make because you can throw in many random things to make a delicious soup. I make a lot in winter, almost every day, so we will have enough veggies on the table plus the soup warms you up.